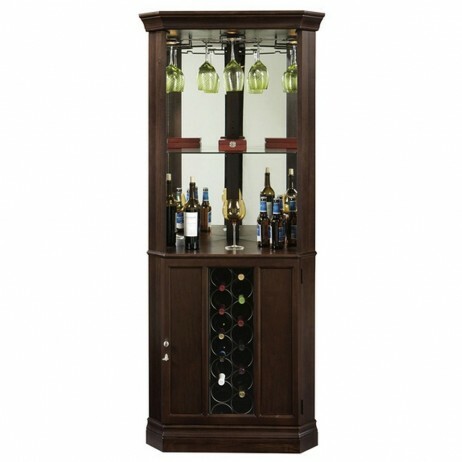 The lower cabinet features a metal wine rack with a capacity of 13 bottles, and two fixed shelves, which offer storage for spirits, mixers, and bartenders guides. Touch-Lite adjustable light switch offers four levels of lighting: low, medium, high, and off. 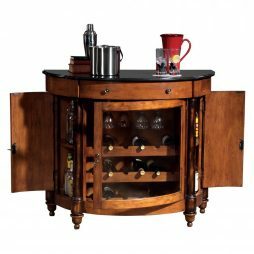 This gorgeous Demilune (half-moon) console features a distressed Vintage Umber finish and Worn Black finished posts with a black granite top for food or beverage service. (The granite top is removable for easier handling). 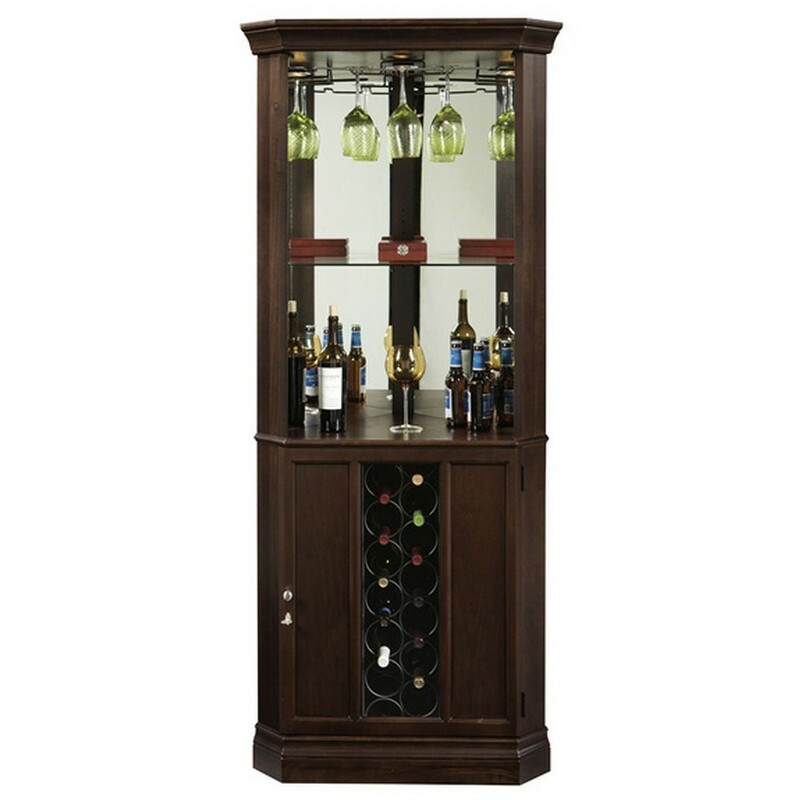 A 18 bottle wine rack and wood stemware rack are showcased behind the front center curved glass. The center accessory drawer features dovetail construction with metal roller guides. Levelers provide security on carpeted or uneven floors. 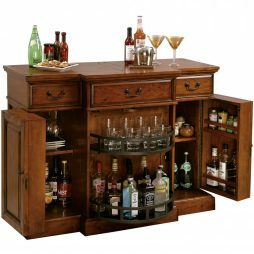 The bar features a locking door for added security. 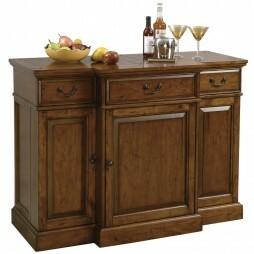 The quality shines through on the Cabernet Hills Wine And Spirits Home Bar. This piece features dove-tailed construction and metal drawer glides on the two drawers, a decorative apron on three sides of the top serving area and bun feet to accent the base. 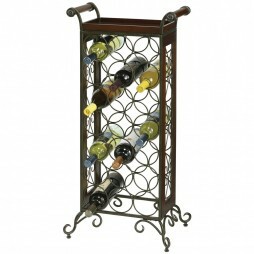 The center wood wine rack holds up to 14 bottles. 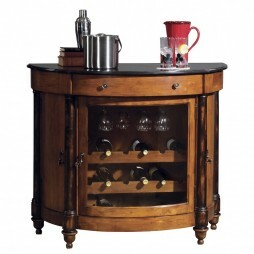 And the adjustable shelves provide neat storage for stemware, glasses, spirits and bartenders' guides. 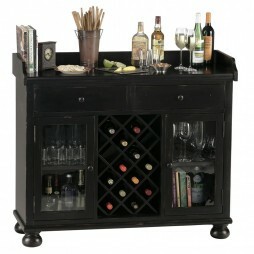 The bar is constructed of select materials, hardwoods and veneers and finished in a worn black finish. Adjustable leg levelers provide stability on carpeting or uneven flooring surfaces. And the door locks for added security.